Torna a farsi sentire forte e chiara la cara voce di David Garland con il suo impareggiabile Spinning on Air, che dopo l'interruzione delle trasmissioni presso la newyorkese WNYC - ne era uno dei programmi veterani, e suo autentico fiore all'occhiello - è diventato un podcast casalingo autoprodotto in un piccolo cottage della Hudson Valley e diffuso in tutto il mondo grazie al web e ai social (e a qualche spontanea donazione degli ascoltatori). Il debutto in questa nuova forma è affidato a una serie di tre episodi (Vivid Voices) dedicati a canzone e cantanti, con protagonisti Jeri Southern, Julius Eastman e Diane Cluck: "The Spinning On Air podcast begins with a series of three episodes focusing on singers and song. Using the body and breath to bring ideas into the world is a basic, fundamental creative action. It can also be abstract and magical, with the power to touch us deeply. There is no more personal sound than our voices, and these interviews let you encounter three thoughtful singers from three different eras and styles, each of whom illuminates their work with insight and care." Tra i materiali aggiuntivi e propedeutici della prima serie c'è un piccolo dossier (Honoring the Impulse for Song) valido anche a sé stante, con contributi di Dave Longstreth, Sufjan Stevens, Judy Collins, Andy Partridge, Laura Marling e Robert Wyatt. Spinning On Air connects us to people who think creatively about what they do. Originals, whose ideas and perspectives can open us up to being more creatively aware in our own lives. 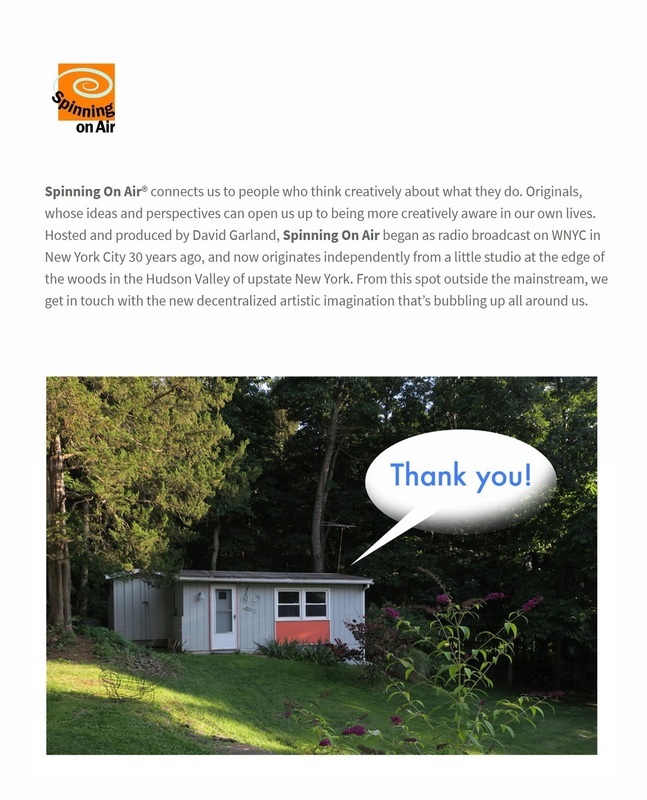 Hosted and produced by David Garland, Spinning On Air began as radio broadcast on WNYC in New York City 30 years ago, and now originates independently from a little studio at the edge of the woods in the Hudson Valley of upstate New York. From this spot outside the mainstream, we get in touch with the new decentralized artistic imagination that’s bubbling up all around us.